The Town of Somerville purchased the Fair Theater in 1999 from Mr. And Mrs. Norman Fair. The Fairs built the movie theater in 1935, and on a special night in October 1935, the projectors were turned on for the first time in the new theater building on East Market Street of downtown Somerville, Tennessee. The Fairs continued to show movies until the theater was damaged by fire in June of 1953. It was renovated and reopened in April of 1954. The new theater featured wide-screen CinemaScope pictures with improved sound. Mr. and Mrs. Fair were a vital part of employment for the youth and teenagers of Fayette County, utilizing them in every aspect of the theater, from selling tickets, running the projector, working concessions, and ushering. Age and declining health prompted the Fair family to sell the theater to the Town of Somerville in 1999. Since the Town acquired the theater, it has benefited the community in many ways, including its original purpose of showing movies, local religious groups have held worship services there, youth meetings and musicals, and puppet shows for children. The American Cancer Society Relay-for-Life teams continue to use it as a fund raising location, holding musical shows and beauty pageants. Several groups have leased the theater to hold family musical events. Political groups have used the facility for political rallies. The Fayette County Cotton Festival holds a live auction annually in the theater, plus other Cotton Festival events. Professional story tellers, in conjunction with the Fayette County Library and the Memphis Arts Council hosted the Fayette County School children for a storytelling event. The theater was the stage for acting lessons for local children taught by Ms. Irene Crist, an actress originally from Maryland. Ms. Crist assisted in the great effort to revive the performing arts of Tennessee with her weekly instruction of adolescent and youth. We have hosted the Germantown Symphony Orchestra and the Opera of Memphis, sponsored by The Bank of Fayette County, for our citizens to experience the culture of a live symphony. It has been used for a 6th grade graduation ceremony. 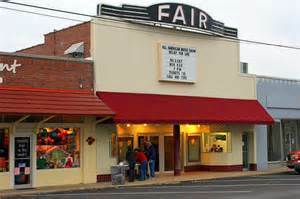 FAIR Theater began live plays in 2006, and continues to present such as "Always...Patsy Cline", "Smoke on the Mountain", "Diamond Studs...The Life of Jesse James", and "Our Town". Local actors and musicians were used to produce these plays. Many volunteers and sponsors help make these presentations possible. The purpose of the Fair Theater is to produce the highest quality professional theater of artistic merit for the people of West Tennessee, Somerville, Fayette County, and the surrounding areas, drawing the citizens of these areas closer together, and allowing the different schools and cultures to pull together and work together for the benefit of our citizens. The Fair Theater is currently operated by Star Incorporated, a theater group located in Fayette County. Please contact Bill Burns at bburns@workingsolutionsusa.com for tickets and more information. Please join Star Inc. on Facebook at Star Inc. Somerville for updated information, tickets and general information.